Spring color is such a welcome site! For those of you who have shade and dark places in your garden you may consider Dicentra ‘Gold Heart’ to brighten up your day. Dicentra ‘Gold Heart’ is a stunning gold-leaved form of the old-time favorite common bleeding heart! Arching peach-colored stems carry chains of deep pink heart-shaped flowers above the dramatic metallic gold leaves. The fern-like foliage appears early in the spring and provides a colorful point of interest in the shade garden. 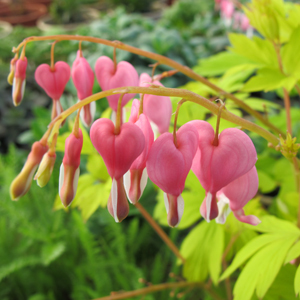 Like other Dicentra spectabilis, ‘Gold Heart‘ will go dormant during the heat of the summer. We recommend planting near hostas or ferns that will fill in the area after the Dicentra foliage dies back.